For Key And Peele, Biracial Roots Bestow Special Comedic 'Power' Keegan-Michael Key and Jordan Peele each have a white mother and black father, and a lot of the jokes on their Comedy Central show are about race. Peele tells Fresh Air that their backgrounds allow them to do characters others would feel uncomfortable doing. Keegan-Michael Key (left) and Jordan Peele both started their careers at Second City, Peele in Chicago and Key in Detroit. This interview was originally broadcast on Nov. 20, 2013. 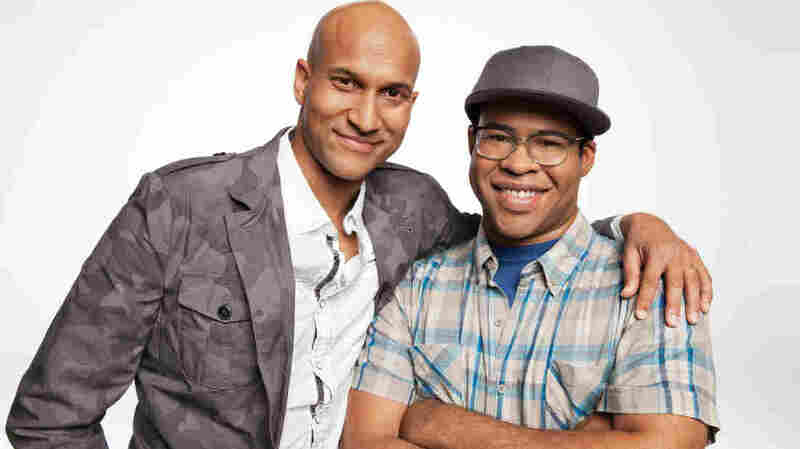 Keegan-Michael Key and Jordan Peele are the duo behind the Comedy Central sketch comedy show Key & Peele. Each has a white mother and black father, and a lot of their comedy is about race: Perhaps because they're biracial, they're perfectly comfortable satirizing white people and African-Americans — as well as everybody else. The New Yorker's TV critic Emily Nussbaum describes their biracialism as a "Golden Ticket to themes rarely explored on television." Peele tells Fresh Air's Terry Gross, "I think the reason both of us became actors is because we did a fair amount of code switching growing up, and still do." Key and Peele met in Chicago, where they were part of the improv scene, and later worked together on the sketch comedy series MADtv. Their current show on Comedy Central wraps up its third season on Dec. 18, and has been renewed for a fourth. Key and Peele tell Gross the stories behind some of their sketches, and their feelings about Saturday Night Live's lack of female African-American cast members. We know we're frustrated when a person like [Rep.] Joe Wilson had screamed during that State of the Union address, when he was like, "You lie!" to the president. And we were like, "The president can't react the way millions of Americans right now are going, 'Ugh!' He can't say anything. He can't rail at this man, he can't get upset. What if we had a surrogate who could get upset for him?" And that was the embryonic state of creating Luther [the anger translator]. Peele: The way we've described it before is that he couldn't come off like an angry black man, especially early on, so what Luther says are things that ring true to us, and we felt like we were giving the truth a voice in a lot of ways. Peele: Sometimes it feels like silly guidelines, that [there are] certain words you can't say. It's just a strange thing when you look at what the boundary of acceptable and not acceptable is on television. We shoot people in the head in just about every episode. We can't get away with saying certain words. There definitely seems to be an interesting double standard. Key: There is this kind of an urban legend, everybody knows this legend in African-American lore: There's always somebody in your neighborhood named Orangejello or Lemonjello. Peele: If we really dig deep into it, especially when talking about African-American culture, names have such a deep history, just from having our names taken away in the first place and being renamed. Now it feels like 80 percent of the African-American population has the name Washington or Jefferson, some president or slave owner's name. I almost wonder: Is this part of a way of taking back the principle of naming your kid something of your choice? Key: I think the reason why I went into theater, ultimately, was because that was one of those multicultural groups. Because you identify with other people that share similar passions to you, so it didn't matter how much melanin was in their skin. It's just: You have a passion for theater, and ... I have a passion for theater. So that clan is born out of love and passion as opposed to some sense of obligation to belong to a certain group. So for me, that's what salvaged my life in high school. Peele: I really do feel like, growing up, I was lucky enough to be in a great town and great schools that had a certain amount of diversity. All of this goes into our work. I even remember when I was a kid that every now and then you'd come up on somebody who would question how I spoke and whether or not I was trying to be something I wasn't. It cannot be a coincidence that I decided to go into a career where my whole purpose is altering the way I speak and experiencing these different characters and maybe proving in my soul that the way someone speaks has nothing to do with who they are. On the controversy over Saturday Night Live's lack of African-American women, and cast member Kenan Thompson's comment that "in auditions, they just never find ones that are ready"
Peele: For Keegan and I, we know so many hilarious African-American women. We mostly [came] up through the sketch comedy and improv scene. Sketch and improv is a world that is dominated by white performers, that is true. But to say that there's not African-American women who are "ready" is just wrong. I'm the kind of guy who, if somebody says, 'There's no way to make this funny,' I want to prove that wrong. I believe that with the right nuance, with the right touch, you can emphasize the funniness in anything. Key: That question might've snuck up on Kenan [Thompson], and I think Kenan does a job on a show that has a very specific skill set. And so I think if that's the answer coming out of his mouth, I can understand that answer. ... But right now, I can think of three women who would murder on Saturday Night Live, either as writers or performers. Peele: Keegan and my race has really played to our advantage in the improv/sketch world. It's also a bit of a special power. We can do characters that other people would feel uncomfortable doing. We can play black characters and explore the comedy of black characters. There's a whole world of characters and impressions that black women can do that other people — just on the social level, disregarding the practice and skill that goes into perfecting these things, but just on the social level — people would feel uncomfortable doing. They should hire some black women. Not a black woman — black women. So how do you make this universally funny? How do you prove people wrong that this is not about laughing at slavery, this is not about laughing at the victims of slavery and what our ancestors had to go through? The answer to me was to make it about humanity, to make it about people, to make it about something universal, and also to point out the fact that Keegan and I, with this cushy life that we've grown up with in the late 20th century, we are not equipped for the physical and emotional fortitude to do what our ancestors did. For me, there's a certain amount of respect that I felt like we were observing by putting ourselves in that situation, by not "slaving it up" with our dialect but just using the way we talk. Really, that was the project: If we were in this situation, our vanity would come into play.